A sunset in Cartagena de Indias, Colombia. 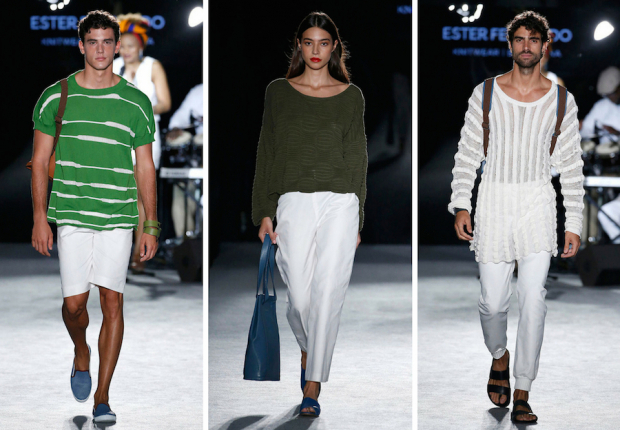 It’s the proposal of Ester Ferrando Knitwear for next spring-summer 2019 season on the 080 Barcelona Fashion catwalk. To her womenswear line, now the designer introduces also men’s designs in this casual and colorful collection with boho touches. Green, yellow, blue and pink enliven “Sunset in paradise”, a collection where knitwear remains the star fabric as it’s usual in the designs of Ester Ferrando. The light knit jumpers for men and women are one of the keys of the proposal along with filmsy dresses for her, that the Catalan designer presents both short, midi and long. The XL colorful sunglasses and the playful costume jewelry top off a collection that dresses the summer in a stylish way.